TWO NEW MOTÖRHEAD TRACKS! Listen to ‘End Of Time’ via Pitchfork and ‘Going To Mexico’ via MTV NOW! 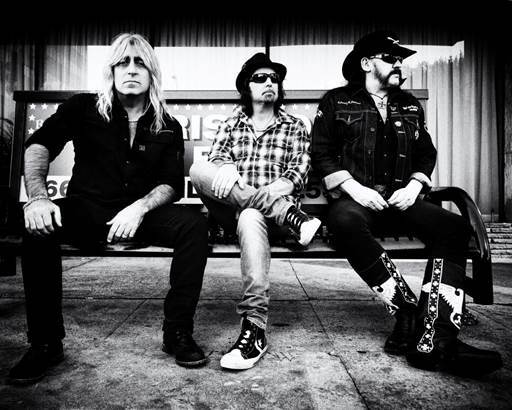 MOTÖRHEAD has released two more killer tracks cut from their upcoming 21st studio album, Aftershock! Today,Pitchfork.com is streaming ‘End Of Time’, and MTV.com is streaming ‘Going To Mexico’. Two more blistering tracks to tide you over until the release of Aftershock on October 22, 2013 via UDR Music. Recorded at NRG Studios in North Hollywood, Aftershockis a true leveler, a crushing confirmation of everythingMOTÖRHEAD stands for, marching from the dust storm to deliver 14 belting statements which see MOTÖRHEAD in perhaps their best writing form for years. You can pre-order the next chapter of MOTÖRHEAD’s legendary catalog now in Limited Edition Digipack format viaAmazon.com at this link. The album is also available for pre-order now in regular CD format and vinyl (gatefold – 180-Gram Single LP) format (digital coming soon). MOTÖRHEAD recently announced their upcoming official listening party, taking place at the world-famous Rainbow Bar & Grill located at 9015 Sunset Blvd. in West Hollywood. The event is taking place on Friday, October 18th from 9:00-11:00 PM, upstairs. Come listen to the brand new MOTÖRHEAD album Aftershock before it’s released on October 22nd, enjoy free Rainbow Pizza and win MOTÖRHEAD prizes! The first 100 MOTÖRHEAD fans get in free! Finally, all of the bands involved in the Noisecreep.com‘Most Anticipated Release of October’ Poll were great sports, but MOTÖRHEAD’s Aftershock came out on top! Thanks to all who voted. This entry was posted in Artist, Bassists, Classic Metal, Classic Rock, Drummer, Guitarists, Heavy metal, Internet Radio, Metal, Music, Outlaw Metal, Punk, Rock, Rock N' Roll, RockStar, Sleaze, Surrealist, Tattoos, Thrash Metal, Vocalist, Whiskey Metal, Wornstar Clothing and tagged 80's, Bleach Bang, Bleach Bangs, Bleach Bangs Radio, Charlie Owens, Classic Rock, Hard Rock, Heavy Metal, Ian "Lemmy" Kilmister, Lemmy, Lemmy Kilmister, Metal, Mikkey Dee, Motorhead, Music, Phil "Wizzö" Campbell, Randy Norris, Rock, Rock N' Roll, Rock Star, RockStar, the Hellion, the Hellion Rocks. Bookmark the permalink.